I was lucky enough to be able to get in a quick trip to Alaska again. Unfortunately it was a "QUICK" trip. The weather was beautiful for the most part. We did get a big rainstorm daily, but it lasted only 20-30 minutes, then the rest of the day was great. June 26 was summer soltice. The longest day of the year. While the daylight on the Kenai isn't quite as long as in Fairbanks, we did have long wonderful days. This photo, is a shot of the Russian Orthodox Church in Ninilchek, a Russian fishing village. Want to guess the time of day it was shot??? It was 10:30 PM. Yep, at night, can you believe that? :-) Even harder for me to believe was that we never got back to our rooms until almost midnight the entire time we were there. I wasn't tired then, but now that I am home, I am dragging anchor (tee hee). It is going to take me a couple of days to catch up here. A friend of my son's just bought a boat and took us our Halibut fishing in Homer. Here we are headed out of port. What a treat that was for us all. The day was perfect and we found the best fishing spot in the world. Everyone caught their limits in just 45 minutes. It was exciting fishing for sure, as soon as the first pole was in the water we had a fish "on". I of course caught the babies. I know somewhere some mom is really mad at me, but the eating is going to be great. Mike (my son) was very happy with his catch, the largest of the day. Hope you have a good week, and get a chance to "peek" in on someone special yourselves! Wow Wow!! Is this the coolest thing you've seen? This arrived a few weeks back from my internet swap from the Quilted Table. Sue made this beautiful runner for me. I just can't say enough great things about it. I love it, love it. She also included a wonderful little goodie package with it. If you haven't participated in the Quilted Table Yahoo group swaps, you don't know what your missing. Rumor has it, in the next one we will be sending fabrics to our swap partners for them to create something out of and return to us for Halloween/Fall. What a fun idea. 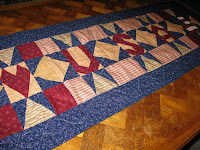 We will send 12 fat quarters of our favorite's, they will create with them, and send us a finished table runner. Any leftover fabrics becomes property of our partners. A great way to make something in their favorite fabrics and extend our own stashes. Win Win, isn't it! I have a link on my blog to join up, so please do so, and get in on the fun. We have a great group of gals involved in it. If it sounds like I am repeating repeating myself, I am. I am just so excited with this group, I have to spread the news! And if swapping isn't your favorite thing to do, they also offer free monthly table runner projects that you can download and make for yourself. All you do is post a photo when it's done so we can all admire each others interpretations of it. Please take a minute to look over our group and join in on the fun. My real job has taken over my life lately, so I have not been able to finish as many projects as I hoped to. After next week, I hope to start sharing some more projects with you all. Last month was a very busy month of classes. Two quilt classes and this jacket class. I am thrilled with the end results of this jacket. It was a bit of a beast to put together. Nothing too hard, just lots of hours of paper piecing, but WOW was it worth it. The pattern is from QuiltFashions.com out of Albuquerque New Mexico, For those interested. They also have a great Kokopelli jacket in the same style, that looks like it is considerably faster to do. While the summer sun will be heating us up soon, I look forward to fall, when I can wear my new project. I am going to consider this as a jump on my fall projects! Probably the first time I can actually say I got something done with time to spare! A sure sign of summer, time to break out those fabric dyes. I am 3 years into this madness, and I can hardly wait for the summer sun to show, so I can get all my supplies out and start playing again. It took me 2 years to actually cut into my treasures. They were so pretty to look at. The perfect eye candy, but I made the leap last summer and, WOW, I sure do like how they work into projects. I've been searching thru my treasure trove of patterns that I have downloaded from online, and found one that I decided I just had to dye fabrics to make. I needed 4 fabrics of each color group ranging from dark to light. The perfect dye challenge. For this I used the same bucket for all 4 fabrics. I just added another layer of fabric and soda ash every 10 minutes. What I ended up with was 4 shades of the same color. Some had better results than others. I am thinking it is because some were purely 1 color of dye mix. The raspberry was rather surprising. The bottom layer was very dark and almost purple looking, and the very top layer was a light blue. A perfect example the different colors in that dye mix. The colors I used for these fabrics as as follows top to bottom. Dharma Trading is my favorite place to order thru. I am awaiting a delivery of some new colors this week. Here is a little teaser for you. Just what do you think I am doing with this?? Stay tuned, I think you will be a little surprised!